I was elected a representative for the Overseas Education Association, which held its meetings in Tokyo. The representatives from Misawa AFB flew to Tokyo for the weekend and sometimes were able to do a bit of site-seeing and shopping. One trip resulted in an outing to a fish market -- lots of fresh fish of EVERY kind were displayed on ice. 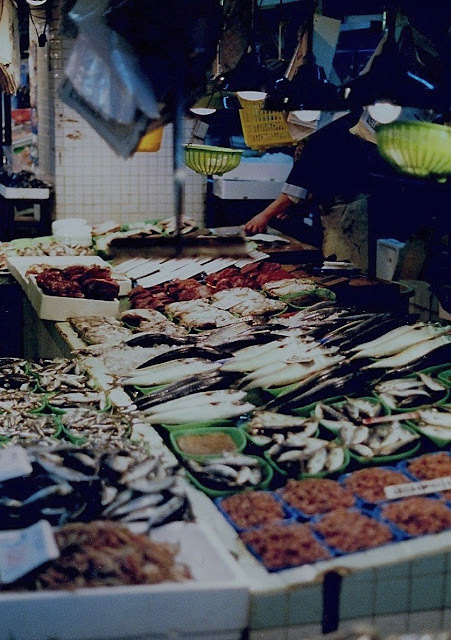 No doubt these fish were purchased that morning at the Tokyo Fish Market. 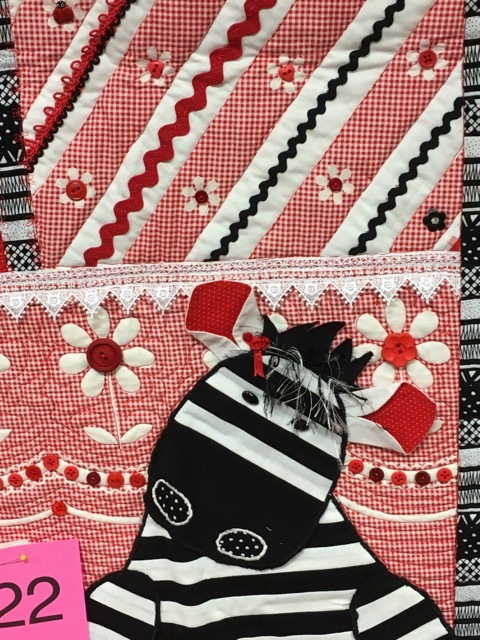 Friday and Saturday, the Popo Agie Quilters hosted their annual quilt show. 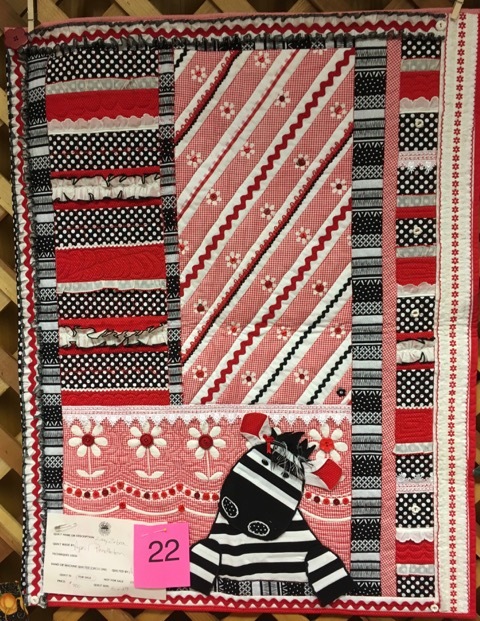 Many beautiful and unique quilts of all sizes were on display. My eye was drawn to two red and white quilts, one of which was just plain fun! Who could resist the Zany Zebra? It was a delight to look at all the clever embellishments. Note the buttons, lace, rickrack, and fun fabrics. 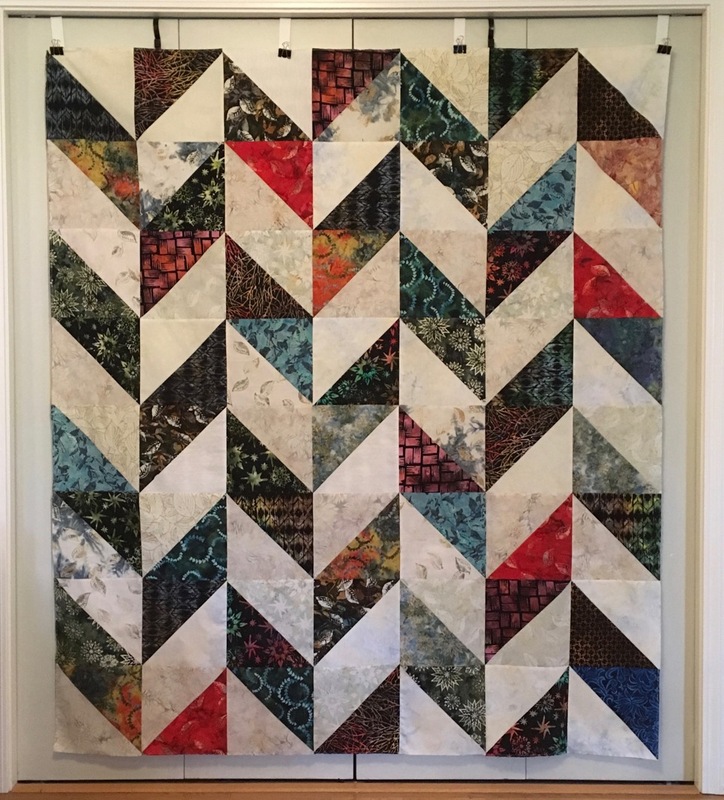 It wasn't a big quilt, but it was huge in creativity. The other quilt that captured my attention was large, but I only captured a portion of the top in my photos. I've seen this pattern before, and I always marvel at the amount of movement the pattern creates for the eye. Look at it a bit, and you'll see what I mean. 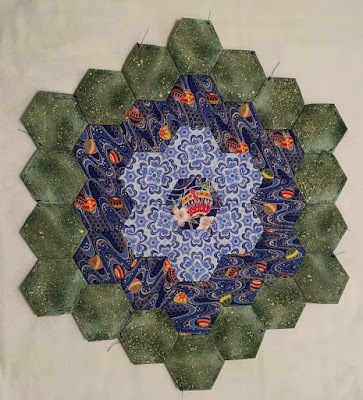 The marvelous part about this pattern is that there are NO curved pieces. 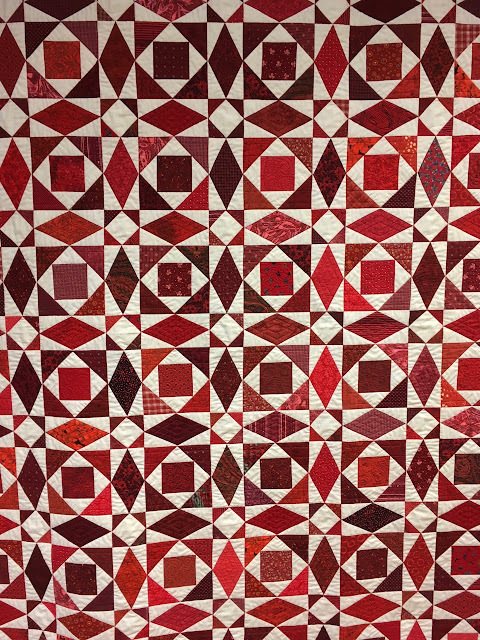 Check out the close-up to see the components of the quilt. 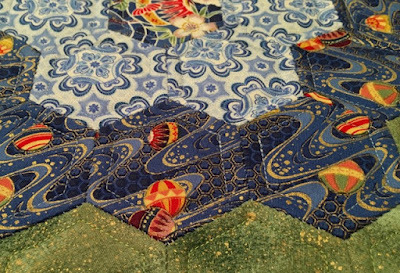 I stood there and allowed my eyes to dance over the surface of the quilt. My hexagon (hex) project is finished, compete with machine-quilting. I have to admit that the process was fun, but somewhat awkward for my large hands, and my hand-stitching is far from perfect and invisible. I learned something new, and I'm pleased with the result. Thanks, Ingrid for the instruction and the templates! You encouraged me to try something new. 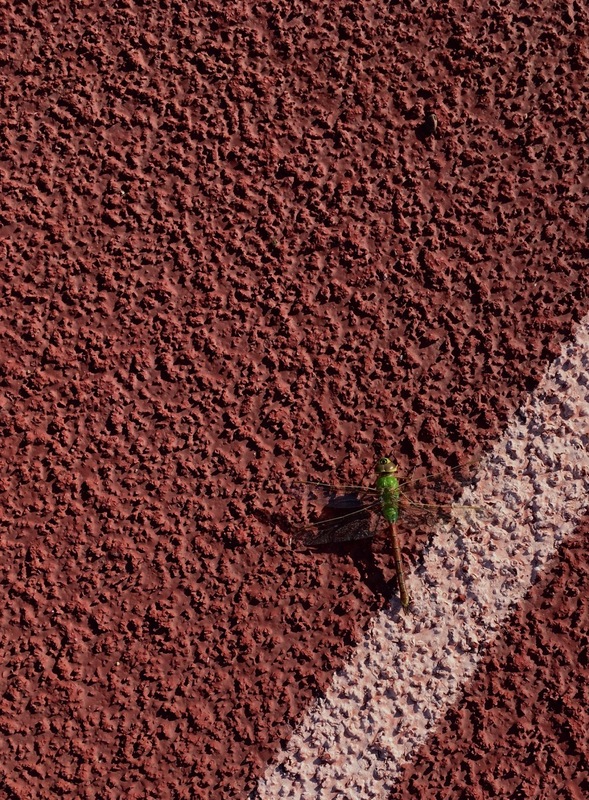 Sometimes, I stop at the local high school and walk a few laps on the track. 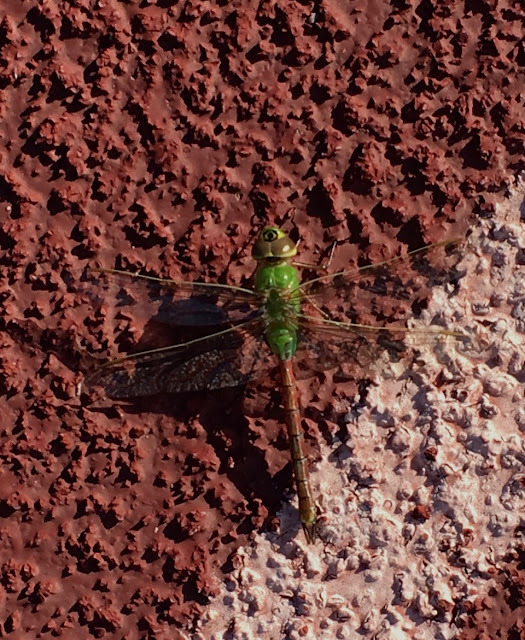 Last week, I noticed something on the edge of my lane, and I stopped to take a closer look. 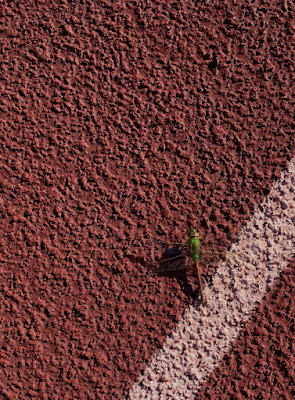 It didn't look too impressive at first, but as I zoomed in, I saw the CBS eye logo on top of its head. Do you think CBS is now using dragonfly drones to film the news? 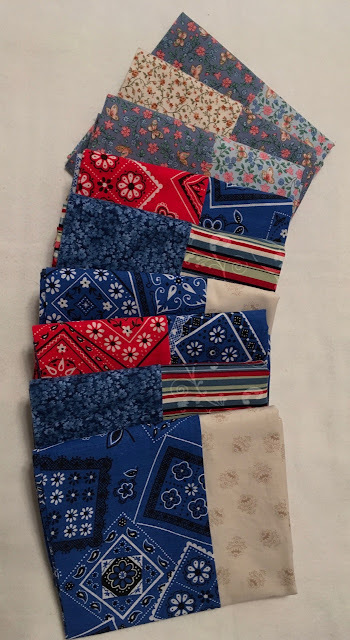 The red and blue bandana prints and the tone-on-tone blue flowers were scraps from quilt backs, the striped fabric was an impulse purchase at a clearance sale, the blue/pink flowered fabric at the top was from Marilyn, and the neutral flowered fabric was large enough for the body of two cases. Approximately nine yards of fabric and scraps out of my stash. During the fall and winter, the local communities (Lander and Riverton) offer an abundance of opportunities to attend live concerts and performances. 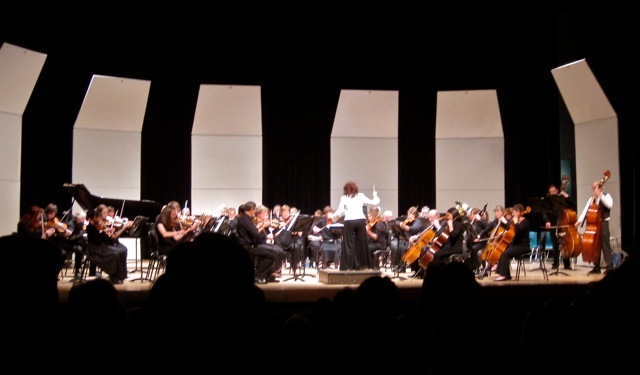 The community college, the public schools, the County Symphony, and the Community Concerts Association provide entertainment, making the long, dark season alive with music and live performances. 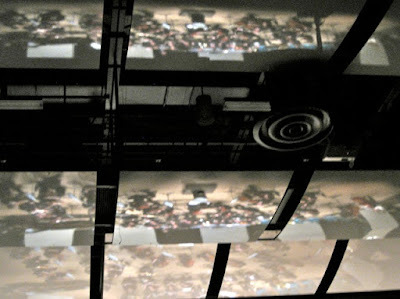 I am eager to see this year's schedule of concerts. 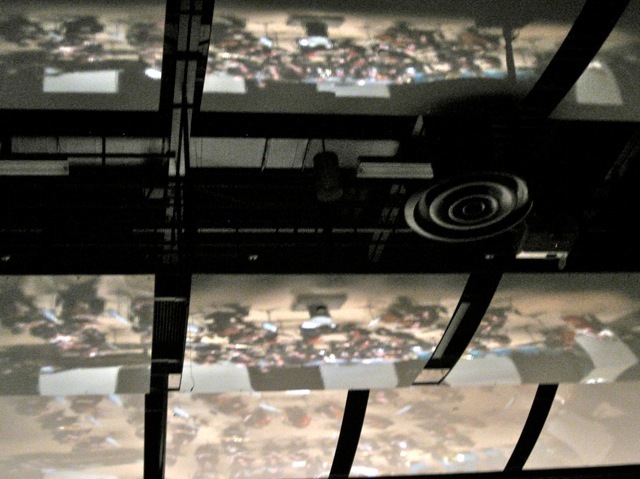 reflection of the orchestra in the acoustic tiles above the stage. Do you attend concerts in your community during the fall and winter? 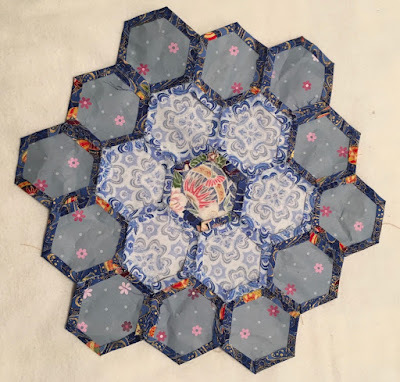 The last couple of years, hexagons or hexies have created quite a buzz on the internet, and every time I saw a hexie blog post, I'd shake my head and mutter to myself, "I'd never spend my time sewing hexies." Ahem, last week I had to eat those words. 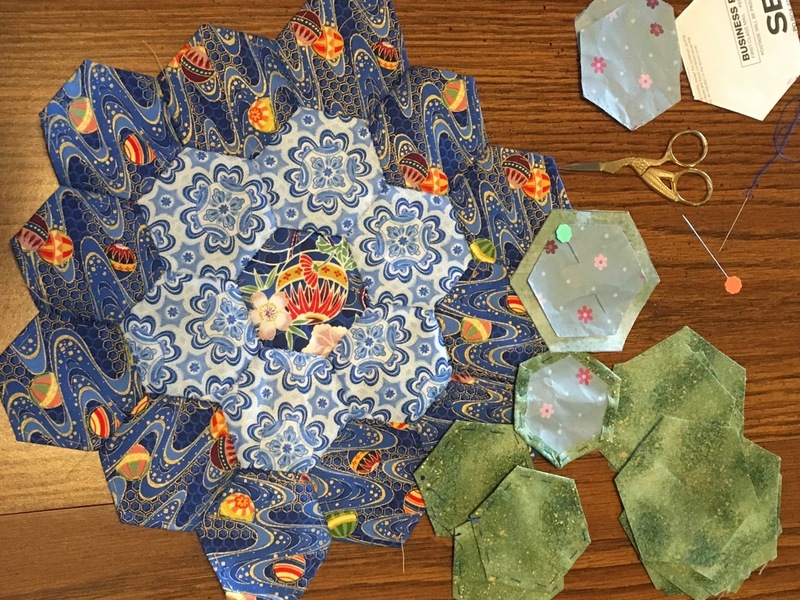 The program at the monthly sewing group meeting was English paper-piecing, aka hexies. I selected fabric, took it to the meeting, and went to work after Ingrid explained the procedure. 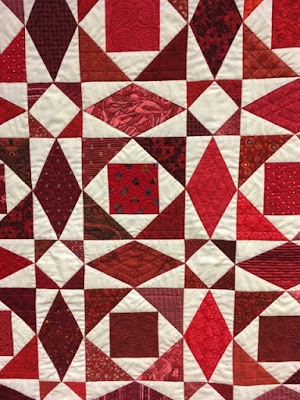 hand-quilt the top as well. 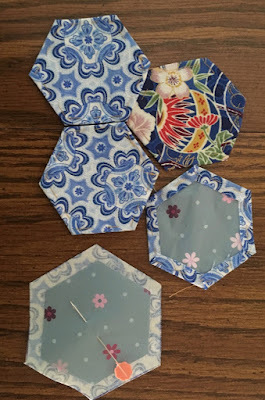 When I got home, I worked on my hexies and had to admit that although it was tedious (I haven't done hand-stitching for years), it was enjoyable. 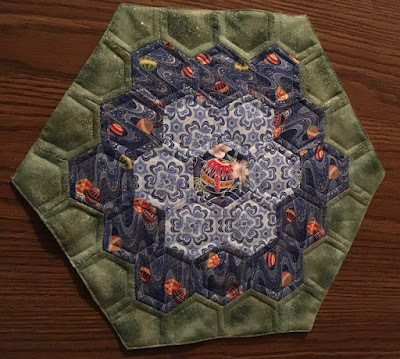 I decided to make a table mat. After I had basted the fabric on the paper templates, the first section went together fairly quickly. 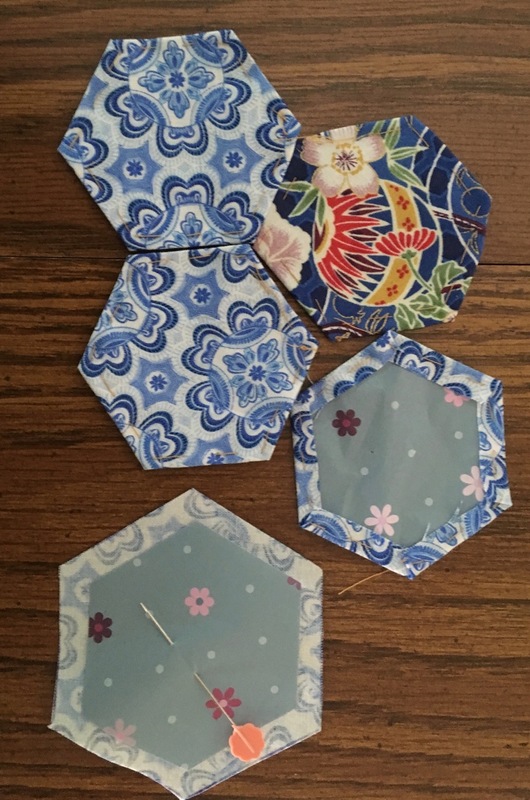 A third round was added, and the paper templates were removed from the hexagons completely surrounded. 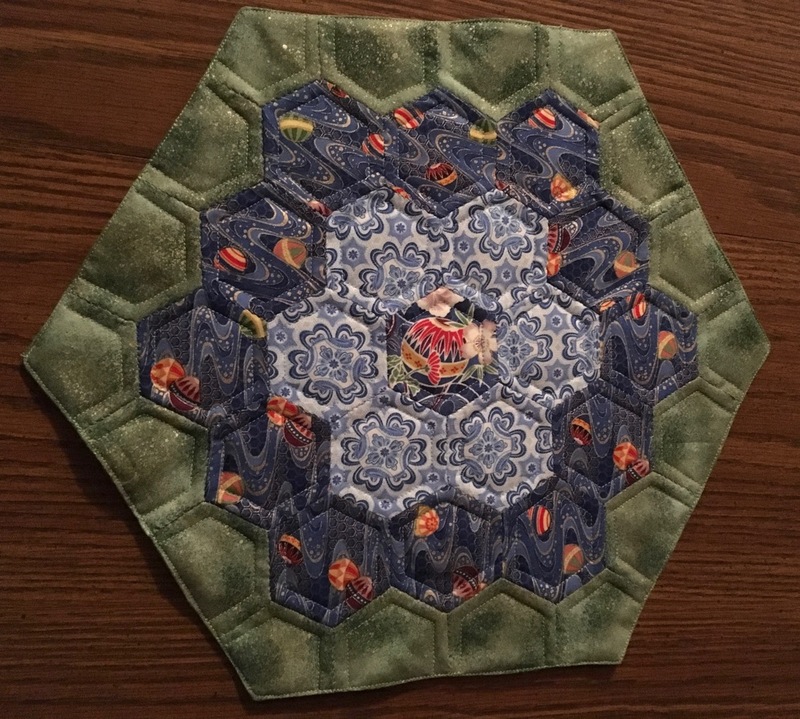 The last round (green hexagons) will soon be added, and then I'll have to decide how to finish the mat - keep the hexagon edge or cut it straight. Obviously, I need to be more careful when I say, "never." 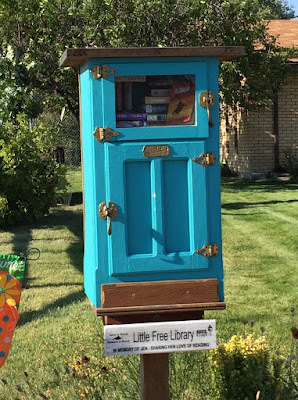 More and more of the Free Little Libraries are visible in the area. 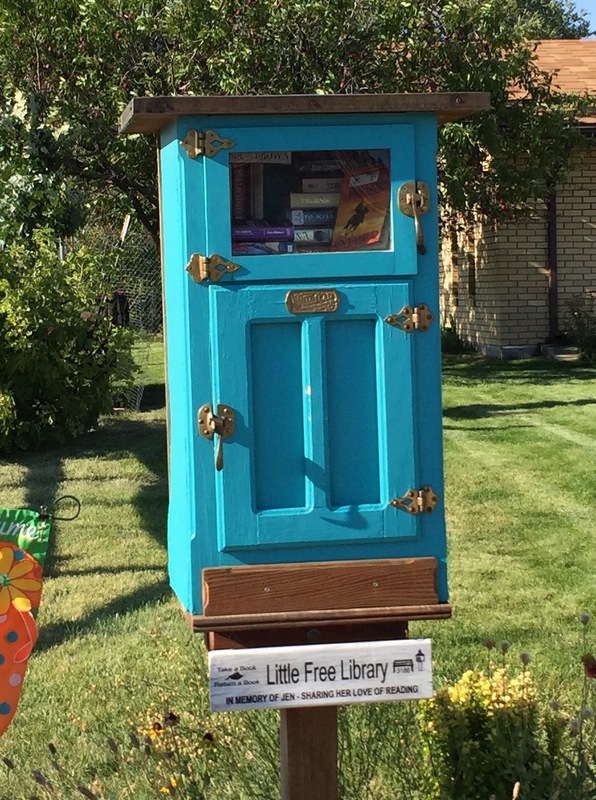 How I'd love to have one in my front yard. 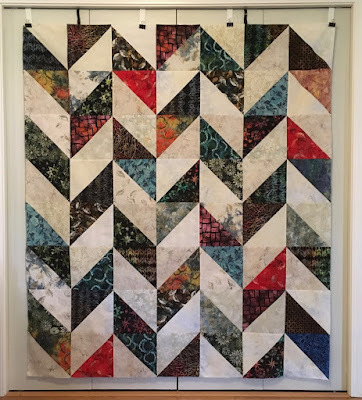 Colorful Feathers was one of the projects I worked on at Marilyn's house in August. I had all but one row finished when I came home: it took me a month to get motivated to make eight more blocks. Last week, this UFO was checked off of my "to do" list. 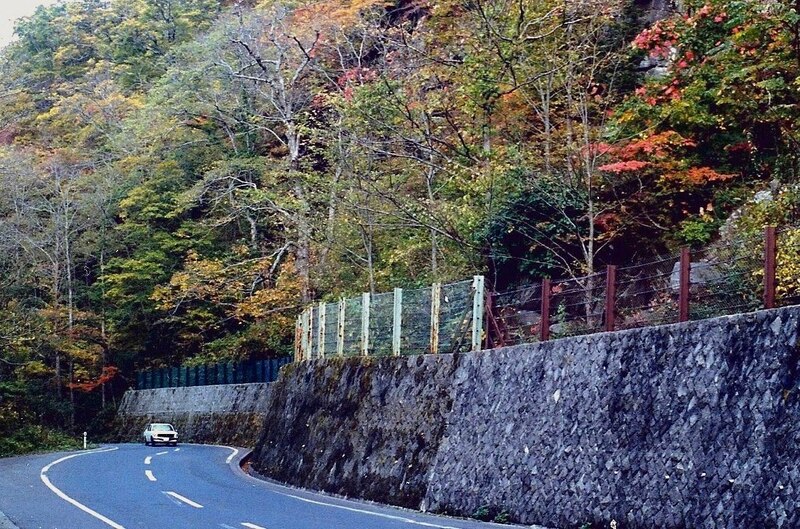 My first autumn in Japan was a fun time to explore and snap photos. This road was on the north and west side of the base and led to the golf course and the lake. Last week, Cheryl and I went to Dubois to hang some posters for the Guild Fiber Fest. I like to stop at the Opportunity Shop when I'm in Dubois. On this trip, I took some items for donation and afterward browsed the aisles for things I could use. In the craft section, I found four bags of cotton yarn: two bags each containing a bit over 3 ounces of blue variegated yarn. 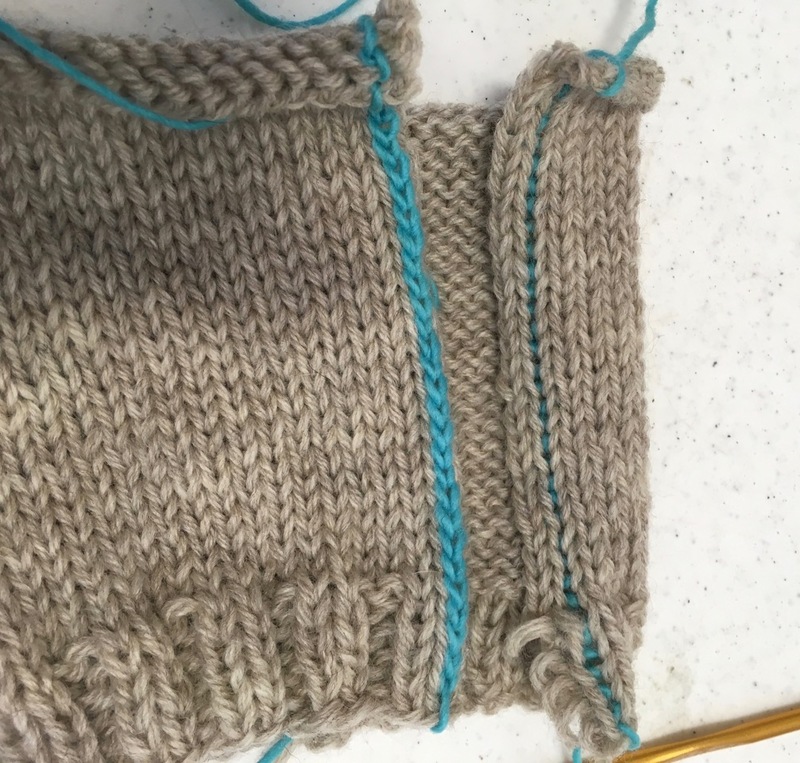 I was able to knit three cloths from the yarn in one bag and will easily get that many from the second bag. Six dishcloths for $3.00 - a good bargain. Another bag contained 3 ounces of solid blue, and the other solid yellow. The cost of the solid cotton yarn was under $3 - another good bargain. Do you frequent thrift shops for crafting supplies? Even though, I've added new yarn to my stash recently, I'm still working on Slashing the Stash. This skein of sock yarn has been in my stash for a long time: the color way is no longer available. 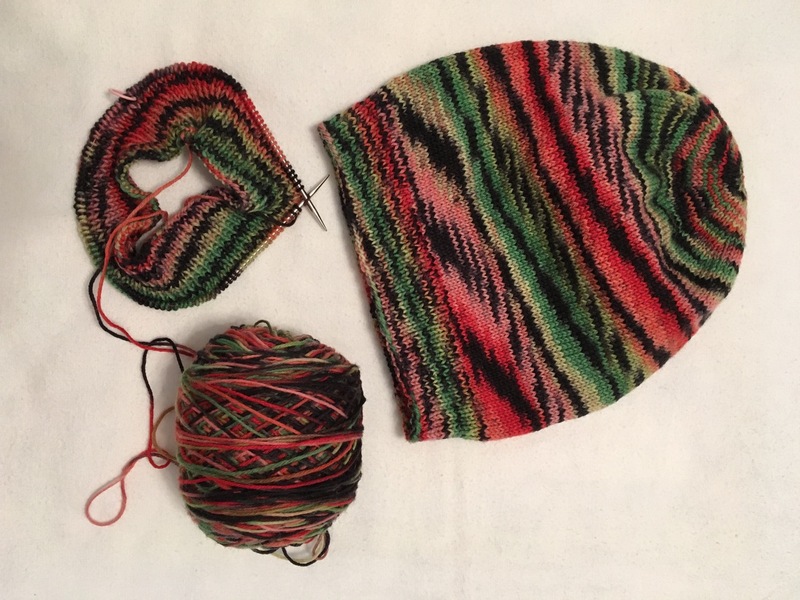 The more I moved the skein around in the stash, the more I knew it had to go, so it became a slouch hat for the donation box. Do you also have yarn in your stash that provokes thoughts of "why did I buy this?" I have two copies of this pattern book and would love to send the extra copy (free) to someone who would use it. 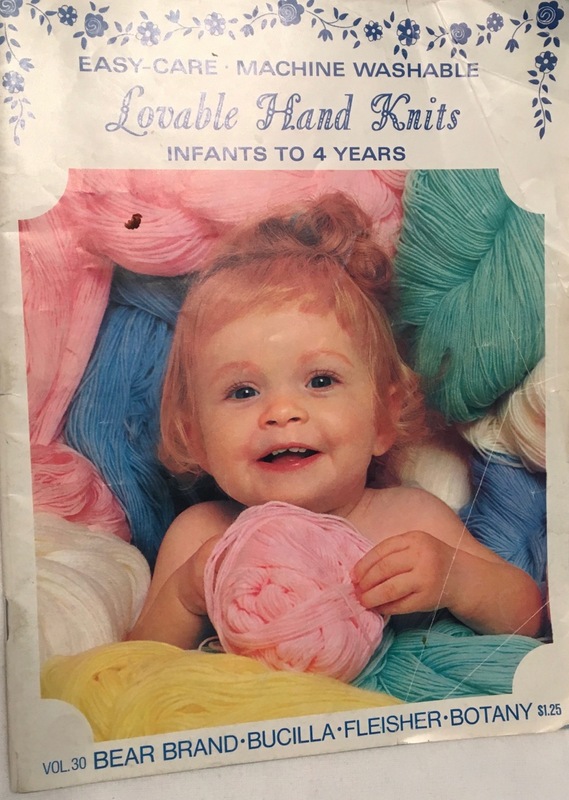 The book contains 63 pages of patterns for infants to four-year olds. I've used my copy of the book many times to knit sweaters. The book contains mostly knitting patterns, but it does have a few crochet ones, too. 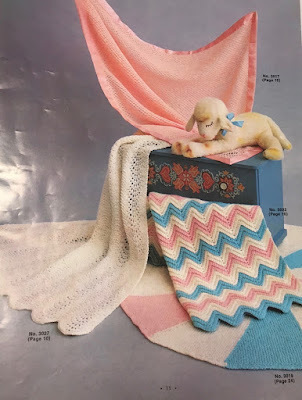 A few of the patterns are for knit and crochet baby blankets. 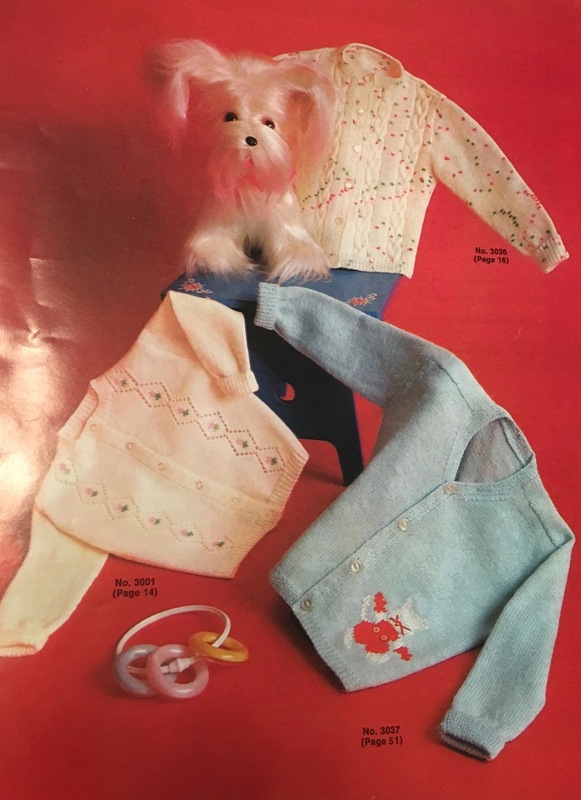 Patterns include sweaters, coats, and dresses for toddlers and even some hats and slippers. 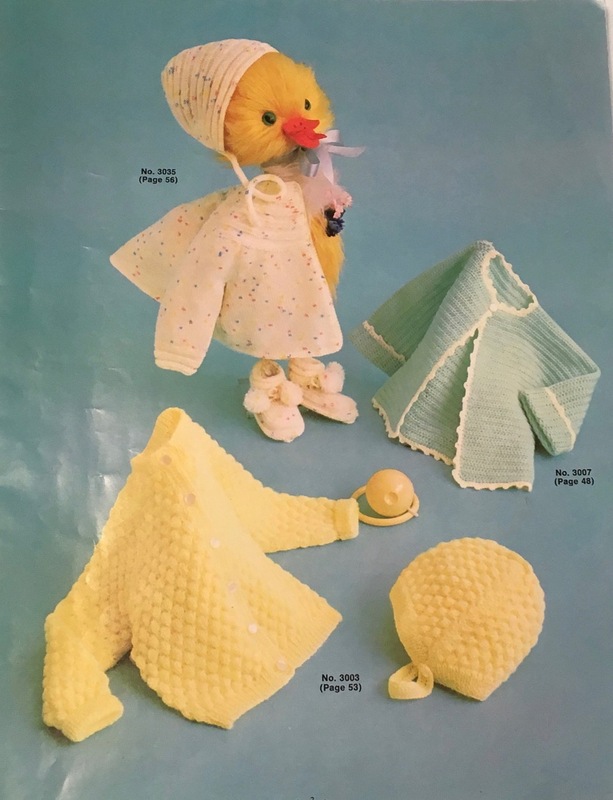 Most of the patterns are classics, but a few are clearly dated. Based on my skill set, I would call myself a knitter. I can crochet enough to add an edge or to a knitted article, but don't ask me to crochet a big project. 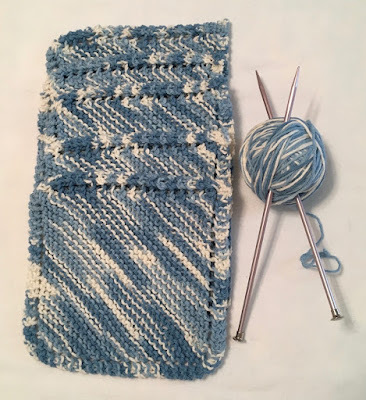 Are you a knitter or a crocheter? 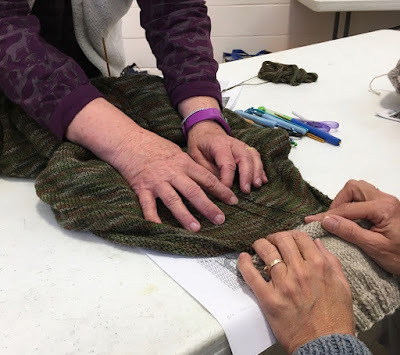 Saturday was a day filled with demonstrations, fiber, and friends. I had a lot of fun, and I learned something, too. One demonstration that I enjoyed was steeking in the round. Brenda had prepared a stack of samples for the attendees to try their hand at the technique. Thanks, Brenda for knitting all those samples. and later steeks to add a button band or zipper. 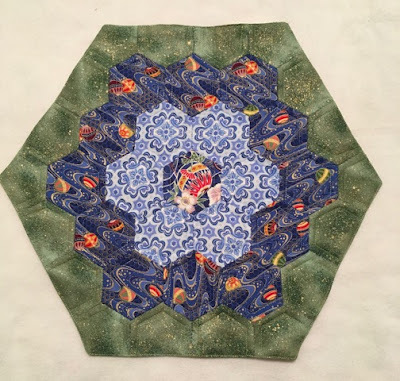 Brenda presented this demonstration at a previous Guild meeting, but I had another task after the meeting and missed it. 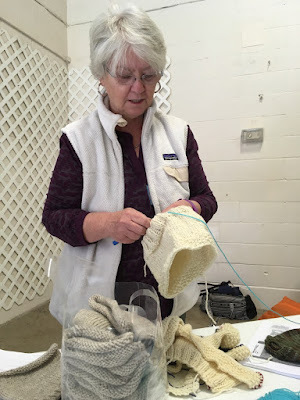 I was thrilled to hear she was doing it again at the Fiber Fest. 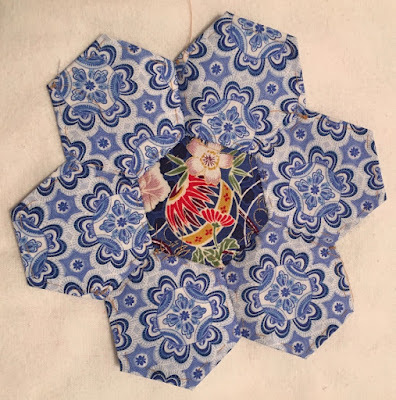 Brenda explained there are at least three ways to steek: using a sewing machine, crocheting over a row of stitches or hand sewing (backstitching on the stitches). 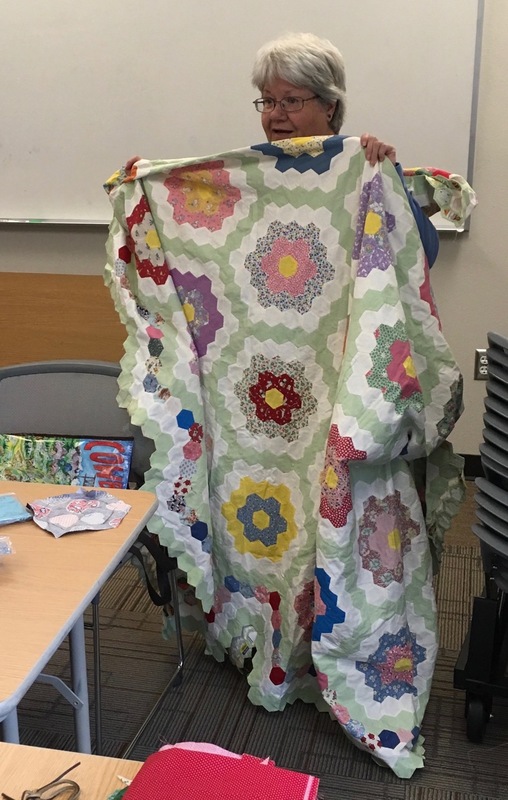 We tried the crochet and hand-stitching during her presentation. Note the two by two rib on the samples. We stitched on the outside stitch on the ribs, but normally a steek area would be purposefully knit in the garment. When the scissors came out, everyone held their breath, but both methods held. The steeked area can then be turned under for a zipper to be attached. Stitches could also be picked up for a button band to be added. 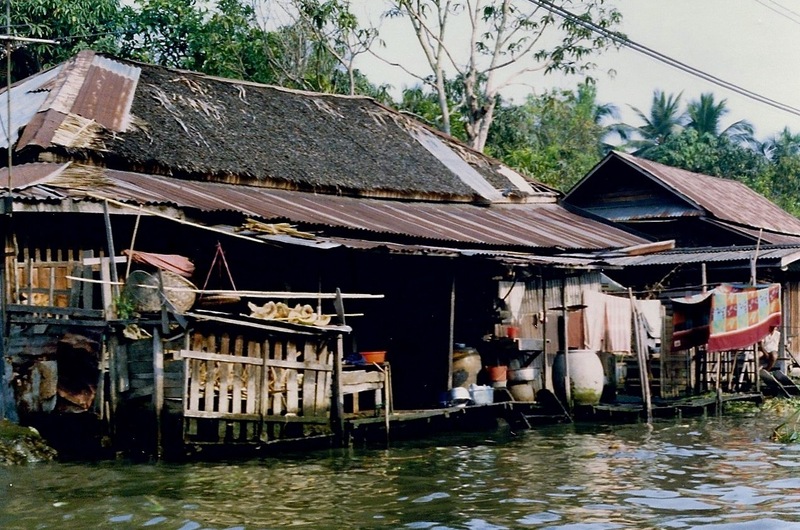 This technique can only be used on "sticky" fibers, like wool, not cotton or acrylic. 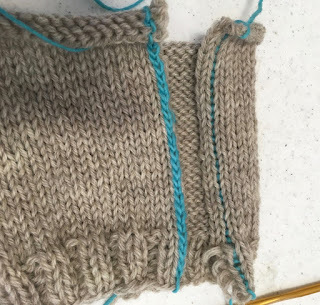 I learned that steeking is not difficult or scary as I had thought. Thanks Brenda! Here's a video of the process from VeryPink. 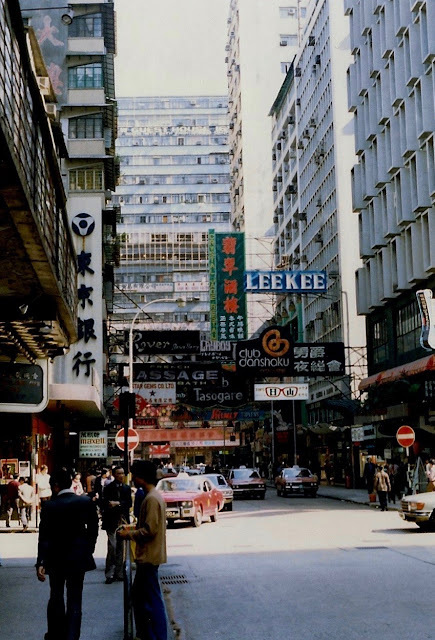 See the sign on the right with red-framed eyeglasses? The shop had a machine that could "read" your current prescription and copy it. I bought an extra pair of glasses in that shop because my vision was really bad (I had LASIX surgery in 2001), and I didn't want to chance being overseas for two years without a backup pair. Yes, I know my thread holder looks a bit odd, but it works in a pinch. I have a traditional cone thread holder (see below), but I don't like unhooking it from the machine in my sewing room. 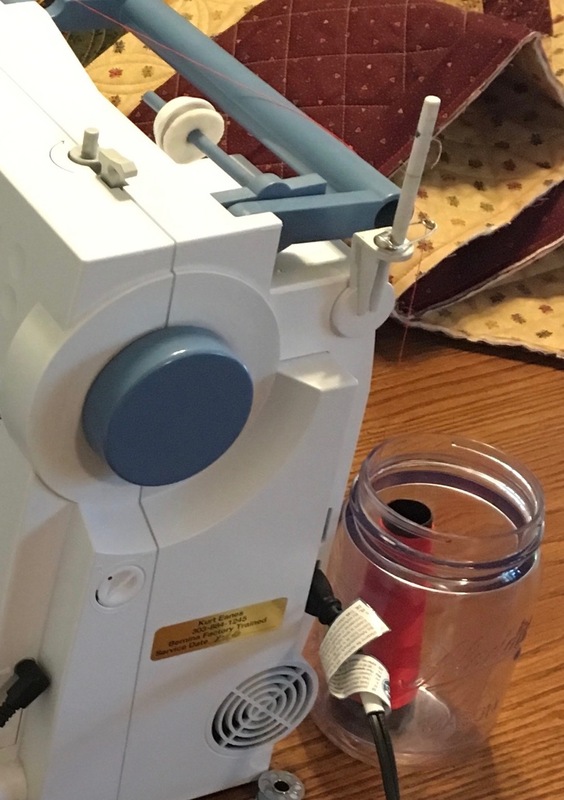 I like this technique for my traveling machine so well, that I purchased a plastic mason jar (shown above) at a thrift shop and keep it in my sewing machine case. The large safety pin is always in my accessories bag. Thus, I'm never caught with a cone of thread that I can't use because I forgot to pack my thread stand. Note: I only use the "stand" with cone thread, never spools. The machine has holders for spools, but not cones.